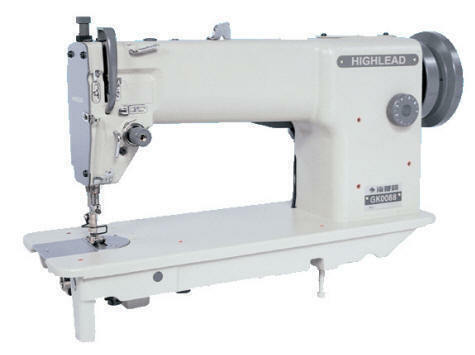 The Highlead GK0088 is an industrial sewing machine manufactured to reproduce the Pin-Point (Pin stitch) special decorative stitch formation. The machine is used to add pin point topstitching onto the outside face of men's & woman's suits etc. This GK0088 is a versatile model and can also be used to add pin point decorative stitching to shirt/blouse collars, sides of trousers, pocket fronts, coats collars and other garments etc. To produce a Pin point stitch the machine uses a specially designed feeder mechanism combined with a top sewing needle and hook needle. 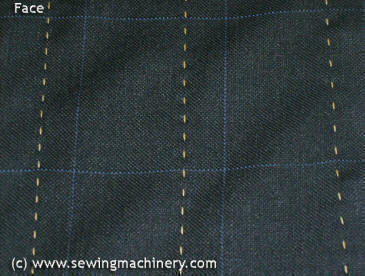 The machine is fitted with a stitch adjusting dial which adjusts the stitch pitch; allowing for different stitch spacing on the front face of the garment (see photo). The machine is operated like a standard flat sewing machine and comes complete on unit stand with clutch motor or optional electronic needle position motor. Face = is presented to machine face down during sewing. 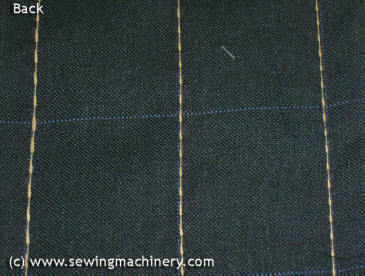 Back = is presented to machine upwards during sewing.